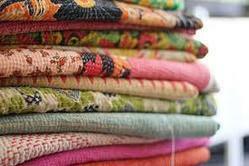 We are a leading Manufacturer of kantha quilt, reversible kantha quilt, handmade quilt, kantha bed cover and vintage kantha quilt from Jaipur, India. We collect saved fabric from multiple saris and stitch them together using colorful threads all over. 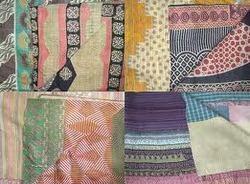 We are prominent manufacturers and suppliers of Kantha Ralli Guddri . 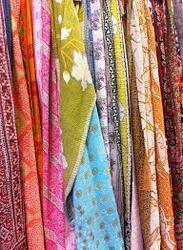 We offer affordable guddri, rallis and quilts in a variety of colors and decorative patterns on both the sides. Our items are regarded for their uniqueness and quality. The fine stitching on these pieces is exemplary. Our Unique Reversible Kantha Quilt are made from vintage fabric pieced together and then stitched all over with running stitch. The vintage fabric comes from misprints, selvedge or even damaged fabrics that were rejected due to imperfections. The artisan's skills of reviving and recycling these imperfections is what turns each piece into a unique and one-of-a-kind collectors piece. 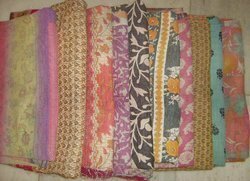 The vintage sari material is stitched together with colorful thread to create these beautiful, softly layered cotton throws. Since each piece is unique, simply choose the size and general colorway that you’d like. This is Handmade Bangali Gudri. This work is done in West Bengal that provides work and livelihood for women in Calcutta's slums. The entire quilt is painstakingly embroidered with thousands of small and delicate kantha stitches to create a one of kind masterpiece!It is reversible, can be used from both sides and both sides have different patterns.It is made from vintage old cotton saris and softly quilted.It is embroiderd by artisans in West Bengal. 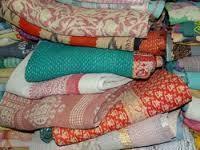 This is Kantha Bed Cover. This work is done in West Bengal that provides work and livelihood for women in Calcutta's slums. The entire quilt is painstakingly embroidered with thousands of small and delicate kantha stitches to create a one of kind masterpiece!It is reversible, can be used from both sides and both sides have different patterns.It is made from vintage old cotton saris and softly quilted.It is embroiderd by artisans in West Bengal.